PA chairman reportedly pursuing new unity coalition with Hamas to blunt US efforts towards peace circumventing PA. 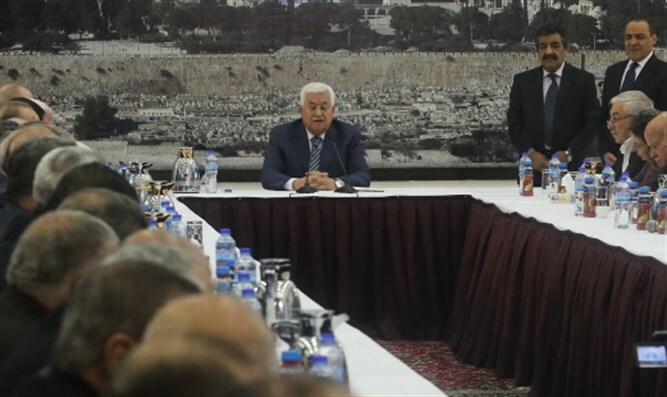 The Fatah-led Palestinian Authority is looking to form a new unity government with the Gaza-based Hamas terror organization, sources within the PA claim, ahead of the first new legislative elections within the PA in more than a decade. According to a report by Asharq al-Awsat, which cited sources within the Palestinian Authority, PA chairman Mahmoud Abbas is pushing for a unity government between the ruling Fatah faction and Hamas, which governs the Gaza Strip. Last year, the two factions signed a formal reconciliation agreement, ending the PA’s economic sanctions on the Hamas-ruled enclave in exchange for administrative control over Gaza, though Hamas has retained control over the Strip as disputes over implementation of the deal have hampered the transition of power. As part of the agreement, the PA vowed to hold new elections both for the PA legislature and leadership of the PA within one year, as well as the formation of a new interim government. Within months of the agreement, however, the PA and Hamas were again deadlocked amid disputes over the implementation of the deal. Now, PA sources claim, Abbas is seeking the establishment of a new government in Ramallah, bringing in Hamas in a coalition under the rule of former PA Legislative Council premier Salam Fayyad to replace the incumbent, Rami Hamdallah. The move is apparently aimed at unifying the PA and Gaza Strip amid efforts by the Trump administration to advance peace in the region even without a comprehensive final status agreement. In recent months, the Trump White House has pushed for moves to relieve the humanitarian situation in the Gaza Strip – steps the PA has claimed would harm its aspirations for statehood. According to Asharq al-Awsat, a senior aide to Fayyad has drawn up a plan to unite Gaza and the PA under a new government – a move which could blunt efforts by Israel and orchestrated by the Trump administration for a piecemeal approach to the PA and Gaza Strip.